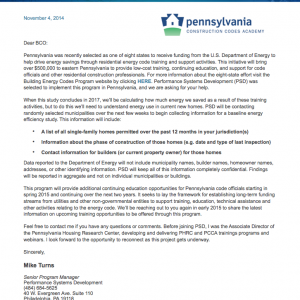 Pennsylvania was recently selected as one of eight states to receive funding from the U.S. Department of Energy to help drive energy savings through residential energy code training and support activities. This initiative will bring over $500,000 to eastern Pennsylvania to provide low-cost training, continuing education, and support for code officials and other residential construction professionals. For more information about the eight-state effort visit the Building Energy Codes Program website by clicking HERE. Performance Systems Development (PSD) was selected to implement this program in Pennsylvania, and we are asking for your help. Data reported to the Department of Energy will not include municipality names, builder names, homeowner names, addresses, or other identifying information. PSD will keep all of this information completely confidential. Findings will be reported in aggregate and not on individual municipalities or buildings. This program will provide additional continuing education opportunities for Pennsylvania code officials starting in spring 2015 and continuing over the next two years. 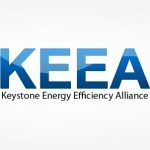 It seeks to lay the framework for establishing long-term funding streams from utilities and other non-governmental entities to support training, education, technical assistance and other activities relating to the energy code. We’ll be reaching out to you again in early 2015 to share the latest information on upcoming training opportunities to be offered through this program. Feel free to contact me if you have any questions or comments. Before joining PSD, I was the Associate Director of the Pennsylvania Housing Research Center, developing and delivering PHRC and PCCA trainings programs and webinars. I look forward to the opportunity to reconnect as this project gets underway.